You can say that again! Well, unless you’re me and managed a stonking D at A Level French, and then… you probably can’t say that again. You see I was top of the class in French all the way through “big” school, got a nice shiny A* in my GCSEs and then discovered that things were about to get serious at college. All those verbs, tenses, and other stuff that I was pretty rubbish at meant that having a good vocabulary could only get me so far. I still (genuinely) wake from nightmares about not having done my coursework, fifteen years later! But just because I’m not the world’s best French communicator doesn’t mean that I can’t hold my own in a Super U! Le fromage, le vin, et le pain au chocolat! I can sweep a French supermarket faster than Dale Winton in a beauty parlour. 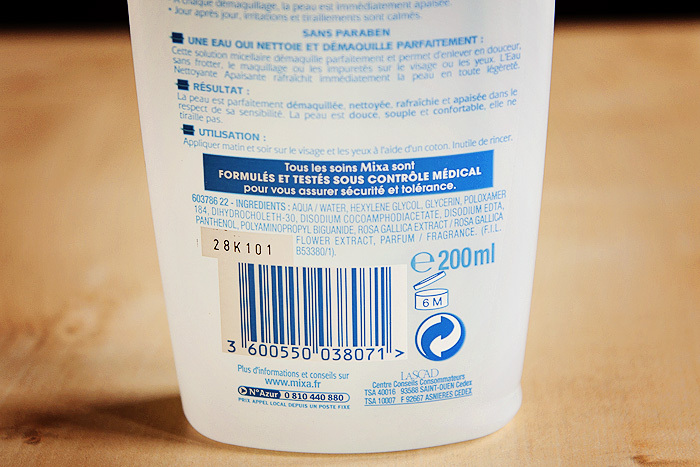 My last attempt at clearing the shelves whilst on holiday was particularly fruitful and I came away with plenty of goodies, one of which was this bottle of makeup remover which I picked up from Monoprix. Mixa appears to be your standard high-street brand with a bias toward sensitive and delicate skins. The brand has an entire range of baby products and Leila is currently working her way through their hair and body wash as I type. The brand have been around since 1924, obviously a French staple… so I can’t help wondering why I haven’t heard of this rather fabulous makeup remover before?! Mixa Expert Peau Sensible Eau Nettoyante Apaisante is, to all intents and purposes, a micellar cleansing water, similar to the legendary Bioderma Crealine. Both cleansers leave no trace of their use behind, no greasiness, residue or anything left on the skin that would make you think you’d used anything other than water to cleanse. Unlike the Bioderma, this one may not be universally suitable for everyone with sensitive skin or eyes. It contains a perfume and has a faint rose scent… something which I love and hasn’t caused me any irritation (remember the Mixa is formulated to suit sensitive, reactive skin) but it’s an important difference to note. As for the performance, it’s on a par with Bioderma… perhaps even better. You see, I buy the Bioderma because I sorta assumed it was the best of the best. But it’s quite possibly not. Make up artists swear by the stuff, stockpile it like it’s going out of fashion… and we (as normal beauty lovers) want in on that action! But, our needs really aren’t the same, are they? Professional makeup artists need a product that will do a sterling job on all their models, and while its performance is in-arguably awesome, I think its merits as a suit-all cleanser override everything else. I put the two cleansers to a side-by-side test. 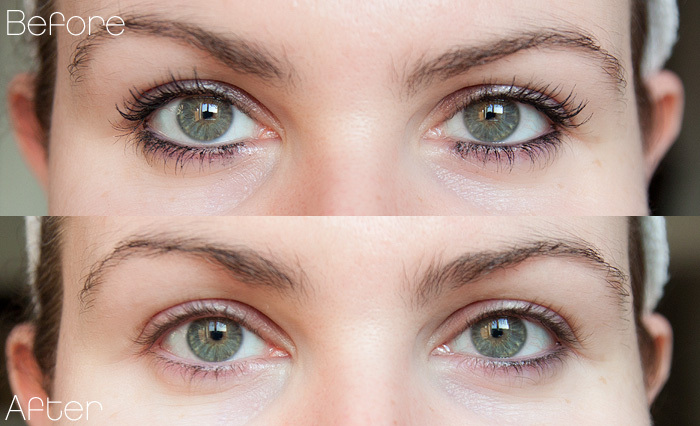 Both cleansers actually did a brilliant job at removing a combination of cream eyeshadow, mascara (non-waterproof), and tight-lined eyeliner… but to my eye, one fared slightly better than the other… just a wee bit… can you see a difference between the two eyes? As you view the picture, I used Bioderma Crealine on the right eye (my left), and the Mixa Expert Peau Sensible Eau Nettoyante Apaisante on the left eye (my right). 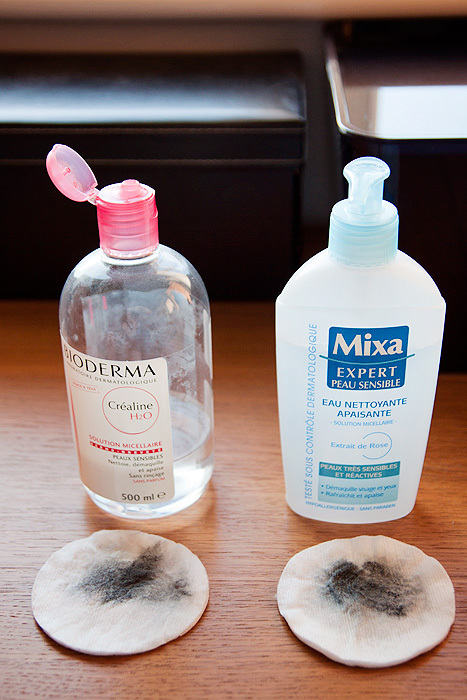 I think that the Mixa outperformed the Bioderma at removing the eyeliner from the lash-line. Neither product caused any irritation to my eye and neither left any residue behind. The clincher for me is the fact that the Mixa Expert Peau Sensible Eau Nettoyante Apaisante costs around 4.50 € for 200ml (but comes in duo packs for 6.50 €) whereas the Bioderma Crealine costs 8.00 € for 250ml or 12.00 € for 500ml. Of course, you have to think about availability and the fact that Bioderma is now readily available in the UK makes this a less appealing swap. However, I’ve already instructed my parents to stock up on the Mixa for me when they return from France in the Autumn. 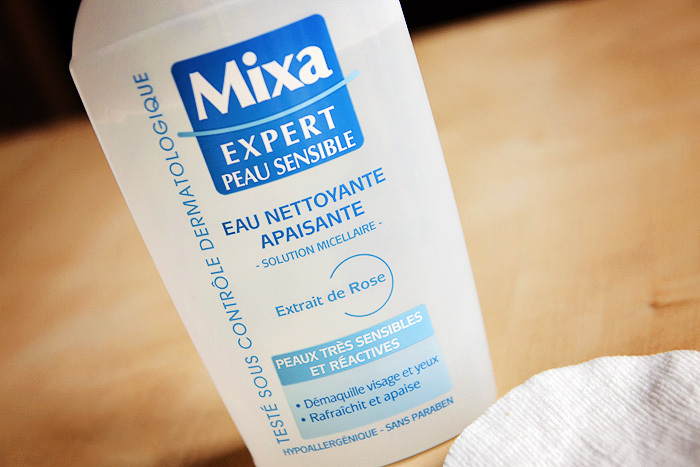 Mixa Expert Peau Sensible Eau Nettoyante Apaisante… bloody brilliant if you can get your hands on it! Nice to know that Bioderma isn’t the be all and end all. Mmm cheap boxed wine mmm. Lol at A Level! I did German GCSE and flew through it, no problems… then three weeks into A-Level classes I panicked and swapped it for an easier option! I won’t say what in case I offend anybody…! 😉 Curiously enough, I managed Latin at degree level, maybe I can only manage dead languages? 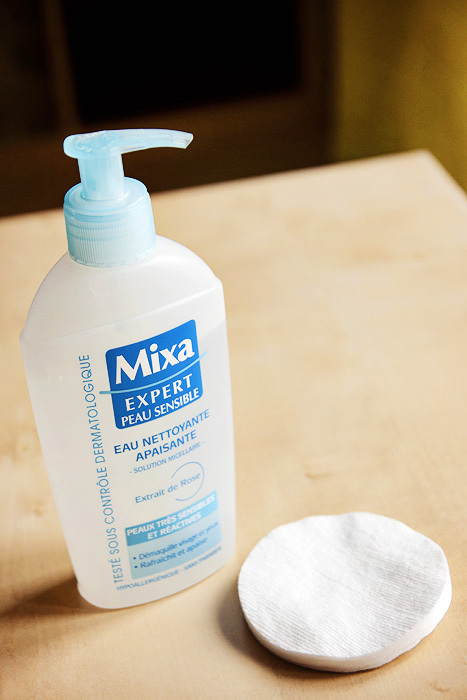 Mixa is a bit like your Simple : straight-forward products, targeted at sensitive skins (all French women think they have sensitive skin FYI). It belongs to the L’Oreal group and was originally a brand for babies (everybody above 25 remembers the “Mixa Bebe” TV ads images & soundtrack with some kind of nostalgia). They have tried to up their game (and their price point!) with more sophisticated products (fake tan, firming body lotions…) but their positioning still very much revolves around accessibility and simplicity. Nice post. I am really interested in this now as I’ve never heard about this brand before, and have been searching on the internet to see if it’s at all available through some french pharmacies online, but no luck! Does it thoroughly remove long wear zinc sunscreen bases? I’ve been experiencing clogged skin and after switching through sunscreens I think I nailed the problem – my cleansing routine doesn’t dissolve the white gunk mineral sunscreen. I am allergic to chemical sunscreen so I am sadly stuck between a rock and a hard place! Hope to hear from you how you reckon it performs at clearing non-makeup stuff on the face! I used to buy this Mixa range for baby care, 13 years ago! You can buy this brand in most supermarkets/hypermarkets. I always loved to buy my baby lotions and wipes on trips to France, because they smelt so good and were effective. I will but this when I go to France next, instead of the much feted Bioderma, which was originally on my shopping list, so thank you for such a useful post!